Netanyahu tells Cabinet that new policy on Judea and Samaria will be in line with Trump's views. 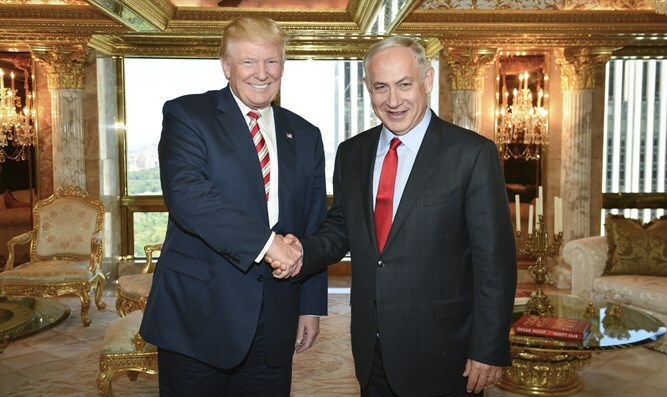 Israel’s new policy on construction in Judea and Samaria will be in line with President Donald Trump’s views on the issue. At Thursday night’s Cabinet meeting, during which a new community for the residents of Amona was approved, Netanyahu told the ministers that taking into account Trump's positions, Israel will take significant steps to reduce the expansion of the built-up areas of Judea and Samaria. He added that Israel would significantly reduce new construction in the region "in order to allow for progress in the peace process." As part of the new policy, Israel will build within the existing built-up areas, wherever possible, and wherever possible, Israel will build near the existing construction line. In places where these two criteria cannot be met due to legal, security or topographical constraints, Israel will allow construction in the area closest to the existing construction line. Netanyahu also clarified to the ministers that Israel would not allow the establishment of new unorganized outposts. Meanwhile, a senior White House official told Haaretz on Thursday night that Netanyahu had committed to the creation of a new community for the residents of Amona before Trump directly expressed his concerns regarding further construction. According to the official, Netanyahu told the American government that he intends to stand by his commitment to build a new community for the residents of Amona. At the same time, the official also said that Netanyahu was also planning to adopt a new policy on Judea and Samaria from here on out that would take Trump's concerns into account. "President Trump has publicly and privately expressed his concerns regarding settlements," said the official. "As the Administration has made clear: while the existence of settlements is not in itself an impediment to peace, further unrestrained settlement activity does not help advance peace. The Israeli government has made clear that going forward, its intent is to adopt a policy regarding settlement activity that takes the President's concerns into consideration. The United States welcomes this. “We will continue to work with Israelis and Palestinians, and other players in the region, to create a climate that is conducive to peace. We hope that the parties will take reasonable actions moving forward that create a climate that is conducive to peace,” added the official. During Thursday’s meeting of the Political-Security Cabinet, the Prime Minister notified the ministers that 2,000 of the 5,700 housing units approved for construction in Judea and Samaria in January were now approved for immediate planning and marketing. In addition, the Prime Minister informed the Cabinet that nearly 1,000 dunams (247 acres) of land in Samaria would be declared state land. The land in question is located near the Jewish towns of Eli, and Adei Ad.